She looks splendid. Original and risky. Queen Maxima could wear this jumpsuit! And a trendy messy bun...wonderful. This is how a royal lady should wear the messy bun. Such a flattering and elegant look. Wooow! Perfection, head to toe! Those earrings are stunning... sigh. WOW! This lady can take minimal jewelry and an edgy silhouette to a new level. Easily her best look of the year. Bravo Majestad! and...May the fates bring only good fortune to you in year 46. She looks truly stunning. Perfect. I don't like her eye makeup but otherwise stunning look. Wow. 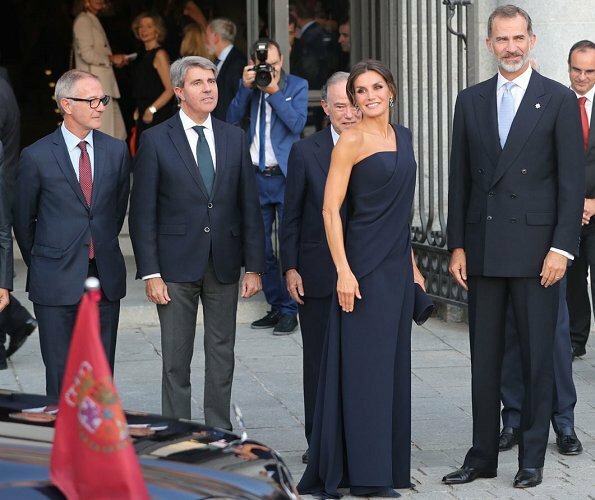 Queen Letizia looks wonderful, dress, color, hair, jewelry. Bravo. 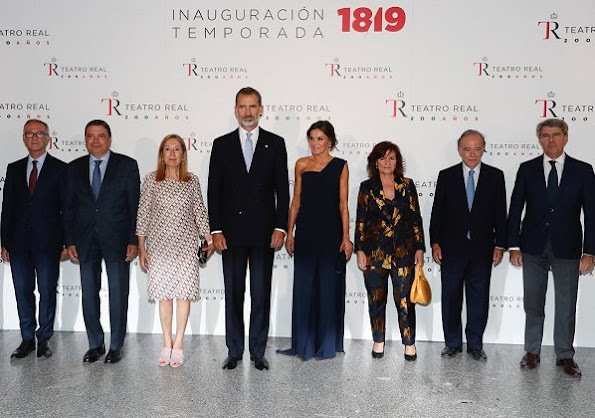 The President of the Congress of Deputies Ana Pastor totally pales in comparison, boring dress and boring color and horrible shoes. Absolutely the best jumpsuit ever, it looks divine. Love also her hair and earrings, not so much make-up. 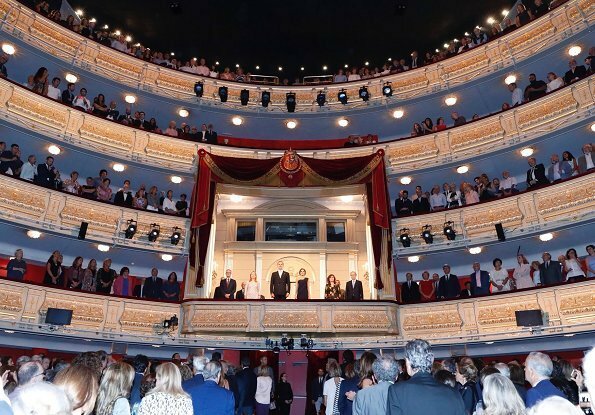 I have one word- wow.It 's spectacular and stunning.Letizia steals a show but I don 't blame her. She looks happy and beautiful, wow! They are such a handsome couple! Elegante , guapa, sencilla, moderna. Menos es más. Tout est absolument parfait dans la tenue de la reine. J'adore! 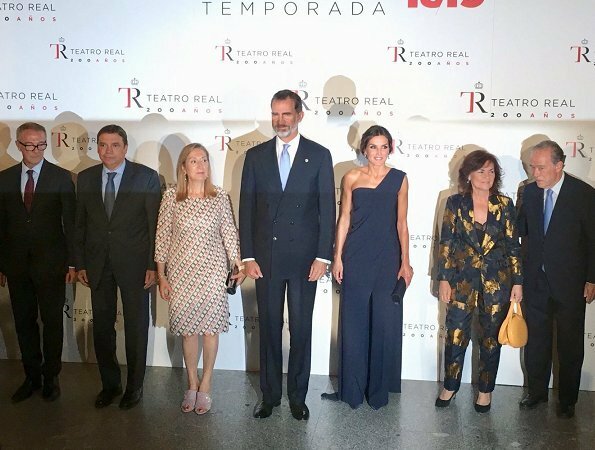 Tenue de soirée magnifique pour la Reine d'Espagne Letizia. Combinaison PEDRO DEL HIERRO en bleu marine superbe et très chic, elle lui va comme un gant, très belle silhouette, d'une classe sans pareil et d'une grande modernité, elle est sublime ! Ses boucles d'oreilles sont très bien assorties, superbe ! Totally stunning, I agree. However I would associate this trendy look with the red carpet Hollywood events rather then a royal opera night. Nothing wrong with being a glamour celebrity queen, if the Spaniards approve of her carrying herself this way. Why won't spaniards approve her attire? I don't see anything " un-regal" about it. Of course there will always be people that find flaws on everything, I remember a blogger attacking her because she had a little thread hanging loose at the hem of her ( otherwise) fantastic pair of pants... SMH!! 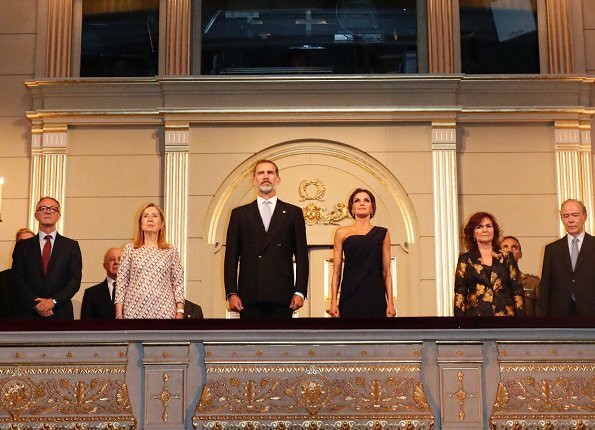 Usted asocie lo que quiera, pero este atuendo es magnífico para la apertura de la temporada de Ópera, que es un gran espectáculo. 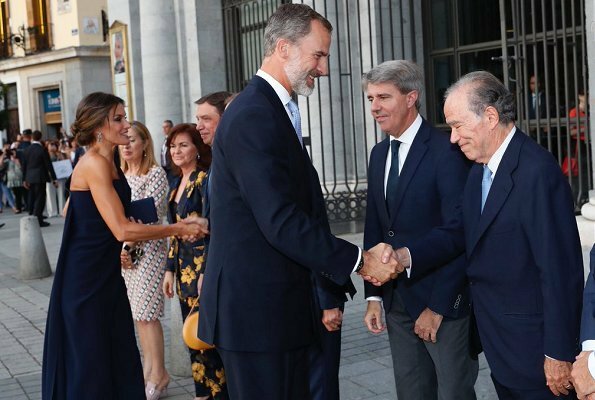 La reina está bellísima y no voy a hablar por todos los españoles porque no les he preguntado, pero YO lo apruebo todo: ropa, peinado, zapatos y las aguamarinas de Bulgari, que son mis pendientes favoritos. This is an opening night of the cultural season. She is the Queen, she is supposed to stand out at such an event, not be a wallflower. Today, most people know what she wore, but they also know that the new cultural season has started and the name of the production. That is the objective. She is also wearing Spanish fashion. The entire outfit is fabulous. In fact, the rest of the royals can go home, RL has just won the best dressed of the year. Number 2 goes to Meghan's white dress for the wedding reception. Wish more royals were glamourous like this! Occasionally Catherine and Mary are similar, but Letizia was gorgeous and so glamourous this night. I like everything about this look every single thing , especially the color of the jumpsuit and the make up .